"Pietro Mascagni himself was invited to Holland to conduct CAVALLERIA in one of the annual Italian guest seasons. One performance (November 7, 1938) was professionally recorded, although it did not circulate until the late 1960s. The composer brought with him his then-favourite Santuzza, Lina Bruna Rasa and Antonio Melandri. Rehearsal time was evidently limited but Mascagni, a highly experienced (and regularly active) conductor of music, from his beloved Beethoven symphonies to contemporary works, delivers an intensely interventionist, rubato-laden reading of his score, holding back then rushing forward with risky (but nearly always achieved) abandon. Bruna Rasa manages an ideal combination of dangerous mezzo chest-voice when threatened, utter soprano vulnerability in defence and the most resonant handling of the words. Melandri expands on his already potent performance on the Columbia 1930 studio recording. Their duet is both the wildest and the grandest yet caught on disc, the composer/conductor hanging on, seemingly for ever, to its concluding coda/transition. Afro Poli is a charismatic, sinister Alfio, given over to the buffo habit of interpolating spoken 'si's , 'no's and he even growls (after the vengeance duet) to beef up the emotion of the moment. This vital performance has unique gravitas and danger." "In his performances of CAVALLERIA RUSTICANA at the Met, by his own account, Leonard Bernstein, on grounds of historical fidelity, copied the notoriously slow tempos of the Mascagni-conducted studio recording of the opera from 1940. However, in the recording of the performance heard here, from two years before the studio recording, running times are faster even though he slows down more often. In the live version tempos ebb and flow almost continuously, with gradations so subtle that you never feel a movement lacks a basic tempo. In many styles of music it is desirable to find one tempo that fits the movement, without requiring adjustment, but not here. Because of fewer tempo inflections, the studio recording has insufficient variety and contrast. In both versions Mascagni observed the metronome marks in the score, but this tells only part of the story because there are relatively few of them. Mascagni inflected the tempos greatly. The difference between the recordings in part is the difference between the tempo inflections. In the live 'Intermezzo', in particular, Mascagni employs unwritten ritardandos and accelerandos, seemingly to emphasize harmonic relaxation and to heighten contrast. In the studio version he has many more ritardandos than accelerandos. In both versions the melodies sound more lyrical, more beautiful but at times less propulsive than under other conductors. On the live recording the orchestra has wonderful dynamic range, playing very softly on occasion, and is exquisitely balanced so that melodically important notes are distinguished from harmonic filler, with the musicians treating not notes but phrases as units. The chorus, too, is more responsive to Mascagni on the live version. Lina Bruna Rasa is in better voice on the live version. In the live recording, even more than in the studio version, she sings with great pathos and is moving to the point that her Santuzza is among the outstanding examples of 'il fuoco sacro' (the sacred fire) - what in Rossini's day was called 'singing felt in the soul'. In the live version, Antonio Melandri, sounding like a lighter weight Italian Jon Vickers, sings an uncommonly feelingful and plaintive 'Addio alla madre'. Bernstein evidently was unaware of the existence of the live recording. One wonders what effect it would have had on his interpretation." "Lina Bruna Rasa was an Italian operatic soprano, particularly noted for her performances in the verismo repertoire and was a favourite of Pietro Mascagni who considered her the ideal Santuzza. Bruna Rasa created the roles of Atte in Mascagni's NERONE, Cecilia Sagredo in Franco Vittadini's LA SAGREDO and saint clare in Licinio refice's 1926 oratorio, TRITTICO FRANCESCANO. she also sang the role of Tsaritsa Militarisa in the Italian premiere of Rimsky-Korsakov's THE TALE OF TSAR SALTAN. Lina Bruna Rasa was born at Padua and began her music studies at age 14, studying with Guido Palumbo and Italiano Tabarin in her native Padua, and later in Milan with Manlio Bavagnoli. Her appearance in a 1925 concert at the Teatro La Fenice singing the 'Suicidio!' from LA GIOCONDA created a sensation. By the end of that year, at the age of 18 she made her operatic debut singing the role of Elena in Boito's MEFISTOFELE at the Teatro Politeama in Genoa. She made her debut at the Teatro Regio in Turin in the same role on 21 February 1926, and was engaged by Toscanini to sing Elena for the opening of the 1927 season at La Scala where she made her debut on 16 November 1927. She went on to sing in many notable performances there including the world premieres of Mascagni's NERONE, Franco Vittadini's LA SAGREDO, the Italian premiere of Rimsky-Korsakov's THE TALE OF TSAR SALTAN and some of the earliest performances Wolf-Ferrari's SLY, Vincenzo Michetti's LA MADDALENA, and Respighi's LA CAMPANA SOMMERSA. In a departure from her usual repertoire, she sang Mathilde for La Scala's celebration of the 100th anniversary of Rossini's WILLIAM TELL. In the years between 1926 and 1933, Bruna Rasa sang throughout Italy as well as in Montecarlo, Nice, Lausanne and Barcelona where she sang Aida at the city's Gran Teatre del Liceu. Further afield, she travelled to Egypt in 1927 where she sang in AIDA and OMINIZA in Cairo's Teatro Reale. In 1929, she was engaged by the theatrical impresario, Faustino da Rosa, for a series of performances in South America. She made her debut at the Teatro Colon in Buenos Aires on 14 June 1929 as Maddalena de Coigny in ANDREA CHÉNIER with Georges Thill as Chénier. She also sang there in CAVALLERIA RUSTICANA, TOSCA, and LA CAMPANA SOMMERSA in its South American premiere. In August, da Rosa's singers went on to Uruguay where she sang in ANDREA CHÉNIER (again with Thill) and TOSCA at the Teatro Solis in Montevideo. Bruna Rasa's earliest assumptions of Santuzza in CAVALLERIA RUSTICANA, the role for which she is best remembered today, were in 1927 in Lausanne and Bari. The opera's composer, Pietro Mascagni, and Bruna Rasa met for the first time in Venice in July 1928 when he conducted a performance of CAVALLERIA RUSTICANA in the Piazza San Marco before a crowd of 35,000 people. Mascagni was struck by her dramatic intensity and her powerful yet beautiful voice. She was to become his favourite Santuzza. 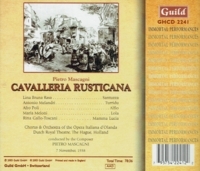 He subsequently conducted many of her performances in the role both in Italy and abroad and chose her for the 1940 recording of CAVALLERIA RUSTICANA which marked the 50th anniversary of its premiere. It is the only full-length studio recording of the work which is conducted by Mascagni himself. In the early 1930s Bruna Rasa had begun showing signs of the mental illness which was to cause her premature retirement from the stage. This worsened with the death of her mother in 1935. She suffered a severe breakdown which led to her spending increasingly longer periods away from the stage, often in sanatoriums. 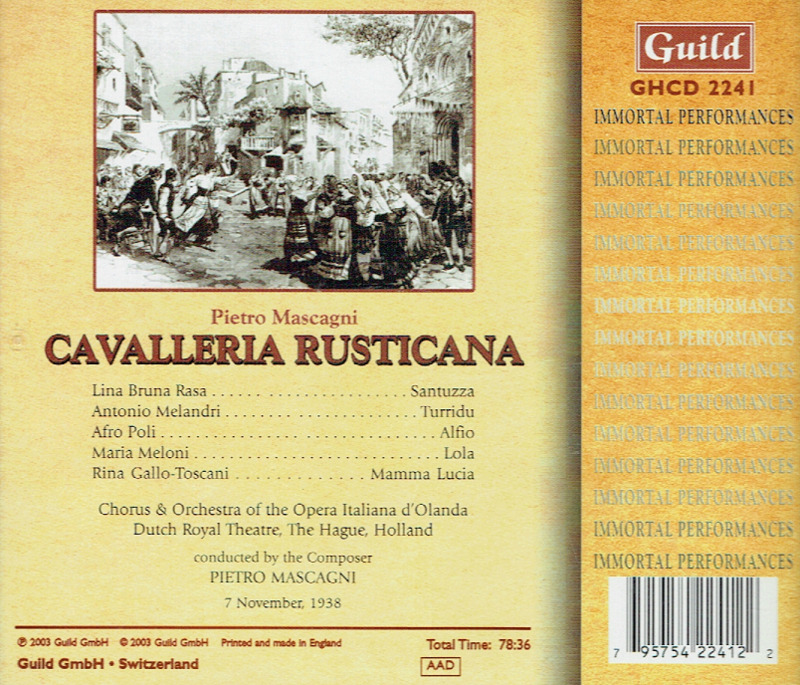 Gino Bechi who sang with her on the 1940 CAVALLERIA RUSTICANA recording recalled that during the recording sessions she would insistently ask him if he had noticed the white horses in the wings that she believed were waiting to take her away, but would become completely lucid when the music began. The tenor Giovanni Breviario who sang with her in Lecco in 1941 recalled: 'Her marvelous voice came to life as soon as she began her scenes. This happened only onstage. We were all very affectionate toward her, but when not on the stage, she was passive, apathetic, would not speak and remained doggedly clinging to her handbag'. On 20 July 1942, she sang in CAVALLERIA RUSTICANA at the outdoor arena in Pesaro. It was to be her final performance in a staged opera. Lina Bruna Rasa opened the 1927 Scala season as Elena in MEFISTOFELE, under Toscanini. That year she sang in the world premiere there of Wolf Ferrari's SLY. 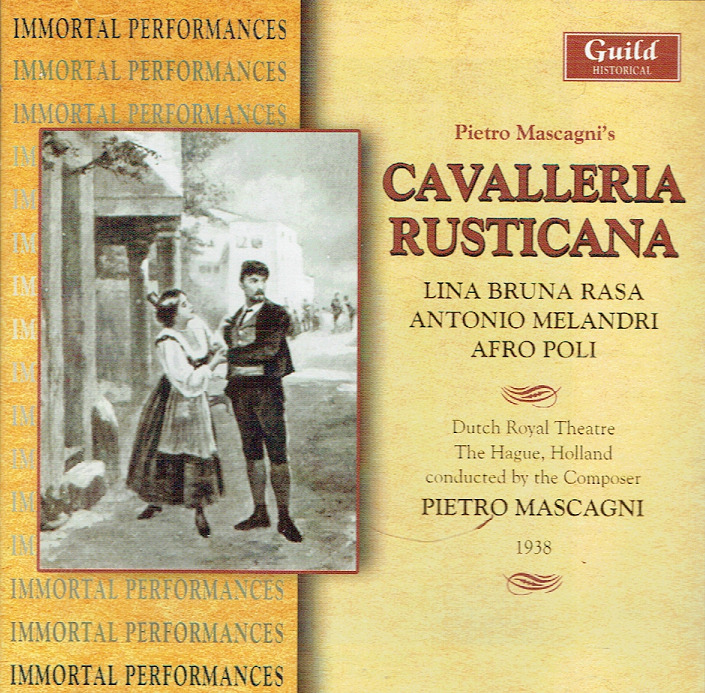 Mascagni chose her for the world premiere of his NERONE at La Scala (1935), for a CAVALLERIA tour in Holland, Belgium and France (1937) and for his studio recording of CAVALLERIA (1940). In 1935, after the death of her mother, she became schizophrenic and in 1937 tried to throw herself into the orchestra pit during a performance. In 1940 she was institutionalized but was released occasionally to perform. She moved Toscanini to tears at a 1947 Milan concert. After an unsuccessful comeback in 1948 she was returned to the institution. Lina Bruna Rasa spent the last 36 years of her life in a mental hospital in Milan, where she died."